Martinez has the philosophy wherever he has managed to play out from the back, this even includes the goalkeeper. Last year we saw the risk of Martinez’ philosophy, with Wigan conceding several goals from sloppy defensive mistakes. Early on this season Everton have not conceded from a footballing error, but there has certainly been an alarming number of needless chances conceded with the Blues trying to play out from back. All of this begs the question, do we really have the footballers in defence to play this new Martinez philosophy or will we just become another Wigan horror show? Tim Howard the shot stopper, not the footballer! Under Everton’s new way of playing even Tim Howard is being asked to play football along the floor instead of just releasing the ball up field as preferred by previous manager David Moyes. We all know that Howard is a fine shot stopper, but his skills with his feet are not the best and yet Martinez is insisting that we continue to play pretty football from the back starting with him. Yes we have not conceded a goal from a Howard mistake, but against Chelsea we would have conceded a cheap goal from Howard attempting to play needless football if it was not for a brilliant last-ditch challenge from the debutant Gareth Barry. Do our centre halves have enough flair? When you think of free-flowing footballing centre halves, names like Gerard Pique, David Luiz and Thomas Vermallen come to mind; not Sylvain Distin and Phil Jagielka. 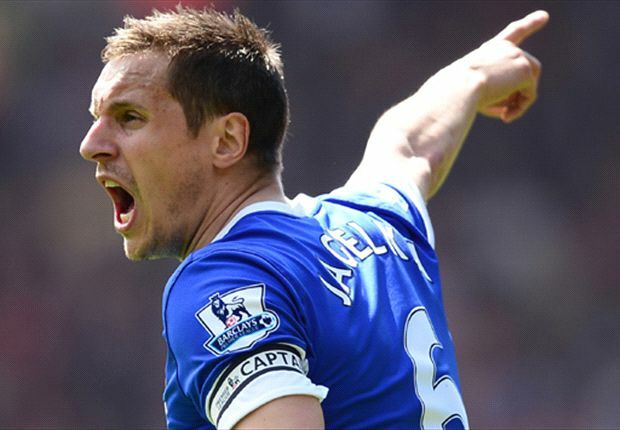 Jagielka is a brilliant defender, he is ruthless, whole-hearted and commits himself to each challenge for the blue shirt, but a great ‘footballer’ some could argue he is not. However this is not to say that he is not a decent footballing centre half; he is reliable and confident with the ball at his feet, but when asked to overplay at the back, that’s when Jagielka can struggle from time to time. On the other hand you have Distin, there is no denying that he is a good defender, but Distin is always liable to make a clumsy mistake, and is saved the majority of the time by the significant pace in his locker. A free-flowing footballing centre half is something that Distin is certainly not, Distin is potentially the most one footed player in the Premier League, so Martinez asking him to pass it along the back and put himself under unnecessary pressure like a centre midfielder is something that to me, does not make a lot of sense. Our wing backs can handle it! The talent we have with our wing backs is where the Martinez philosophy can really come of age. Seamus who initially started playing for Everton as an attacking right midfielder will always be comfortable with the ball at his feet, with the only question mark over his defending. Whereas Leighton, who without the rivalry of Ashley Cole, could potentially have over 50 International caps already to his name, is up there as one of the best left backs in the world, let alone the Premier League. Both Leighton Baines and Seamus Coleman are wonderful footballers, able to play in midfield along with defence. These two have the footballing skill to play football comfortably out from the back, as both are arguably best on the offence anyway. The Martinez philosophy will be a great success with these two players, it is just the others that will struggle adapting to such a new way of playing. Everton under Martinez have made an extremely positive start, still unbeaten in the league and climbing the table. However in all honesty we could have easily lost a couple of matches, due to clumsy football being played at the back, seen against Chelsea and West Brom. We all realise that Martinez’s philosophy will take time to set in, but is this type of football a lost cause with the players we currently have at our disposal in defence. You have to argue that it might make more sense to get the footballers that are able to play his way in first, and then press his stamp on the side; instead of trying to adapt someone who just doesn’t have the tools to play effectively in this way. These are reflections of these players under moyes’s “Fitness first” approach. I think both and particularly Distin have looked more comfortable on the ball in the first 5 games than I’ve ever seen them. I think it will take time, but I do believe Martinez has the right approach. I agree with Mike to an extent, I would rather see us retain the ball that just give it back to the opposition with an aimless punt down field. Martinez is not naive, over time he will introduce ball playing defenders, but it would be wrong to abandon players like Jagielka and Distin who bring such defensive resilience. I think in John Stones we have a ball playing centre back who can go on to be the best in the country. I think you’re being a bit harsh there. Why is it a pointless article? Because you don’t agree with it? The guy’s giving his opinion, nothing more. He’s as entitled to his opinion just as much as you are. Disagree, if you will, but there’s no need to sneer. Just for the record, I agree entirely with the comments of Bobby M.